Graphic Item functions allow Operator Actions, executed in a Graphic Page, to read and write data binding values of graphic items. Display or hide items on a page, for example a pop-up window. Change the text displayed in a text item. Set the text displayed in the tooltip when the user moves the mouse over an item. Allow or prevent a user from interacting with an item. Most of the functions documented here use the ItemId parameter to specify which graphic item to change. 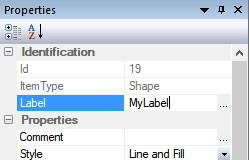 On the toolbar select the Select Shape Tool . Select the item you want to obtain the ItemId of. Note: The above example shows the ItemId of the shape is 12. Cutting and pasting will allocate new ItemId values to the pasted shapes. Breaking a group will allocate new ItemId values to the contents of the group. Gets the value of the DataBindBlink data binding. ItemId DINT The Id of the item. The GraphicItemGetBlink function finds the graphic item using the ItemId parameter. If found, the function returns the value of the DataBindBlink data binding. If the graphic item is not found a runtime error will be reported. You can detect and handle the runtime error by specifying the ENO parameter in a formal call. For more information see Formal Function Calls. Returns a BOOL value indicating whether the graphic item is blinking (true) or not blinking (false). Gets the value of the DataBindDisableActions data binding. The GraphicItemGetDisableActions function finds the graphic item using the ItemId parameter. If found, the function returns the value of the DataBindDisableActions data binding. Returns a BOOL value indicating whether the actions on the item are disable (true) or enabled (false). Gets the value of the DataBindText data binding. The GraphicItemGetText function finds the graphic item using the ItemId parameter. If found, the function returns the value of the DataBindTooltip data binding. Returns a STRING value representing the current text value. Gets the value of the DataBindTooltip data binding. The GraphicItemGetTooltip function finds the graphic item using the ItemId parameter. If found, the function returns the value of the DataBindTooltip data binding. Returns a STRING value representing the current tooltip value. Gets the value of the DataBindVisible data binding. The GraphicItemGetVisible function finds the graphic item using the ItemId parameter. If found, the function returns the value of the DataBindVisible data binding. Returns a BOOL value indicating whether the graphic item is visible (true) or hidden (false). Sets the value of the DataBindBlink data binding. Blink BOOL Whether the item will blink (true) or not blink (false). The GraphicItemSetBlink function finds the graphic item using the ItemId parameter. If found, the function writes the Blink parameter to the DataBindBlink data binding. Writing the value True will make the item blink. Writing the value False will stop the item blinking. Note: If the DataBindBlink is configured on a graphic item, any value written by this function will only have a temporary effect. The value will be overwritten by the data binding at the next data refresh. Sets the value of the DataBindDisableActions data binding. DisableActions BOOL Whether actions are disabled (true) or enabled (false). The GraphicItemSetDisableActions function finds the graphic item using the ItemId parameter. If found, the function writes the DisableActions parameter to the DataBindDisableActions data binding. Writing the value True will disable actions on the item. Writing the value False will enable actions on the item. Note: If the DataBindDisableActions is configured on a graphic item, any value written by this function will only have a temporary effect. The value will be overwritten by the data binding at the next data refresh. Sets the value of the DataBindText data binding. Text STRING The new text to display. The GraphicItemSetText function finds the graphic item using the ItemId parameter. If found, the function writes the Text parameter to the DataBindText data binding. Note: If the DataBindText is configured on a graphic item, any value written by this function will only have a temporary effect. The value will be overwritten by the data binding at the next data refresh. Sets the value of the DataBindTooltip data binding. Tooltip STRING The new text to display in the tooltip. The GraphicItemSetTooltip function finds the graphic item using the ItemId parameter. If found, the function writes the Tooltip parameter to the DataBindTooltip data binding. Note: If the DataBindTooltip is configured on a graphic item, any value written by this function will only have a temporary effect. The value will be overwritten by the data binding at the next data refresh. Sets the value of the DataBindVisible data binding. Visible BOOL Whether the item will be displayed (true) or hidden (false). The GraphicItemSetVisible function finds the graphic item using the ItemId parameter. If found, the function writes the Visible parameter to the DataBindVisible data binding. Writing the value True will display the item. Writing the value False will hide the item. Note: If the DataBindVisible is configured on a graphic item, any value written by this function will only have a temporary effect. The value will be overwritten by the data binding at the next data refresh. Hides an embedded graphic by setting the value of the DataBindVisible data binding of the embedded graphic to False. The HideSelf function the DataBindVisible data binding of the embedded graphic to False. This has the effect of hiding the embedded graphic. The HideSelf function does nothing if the code calling the function is run from a top level graphic page. For the different data bindings available on graphic items.